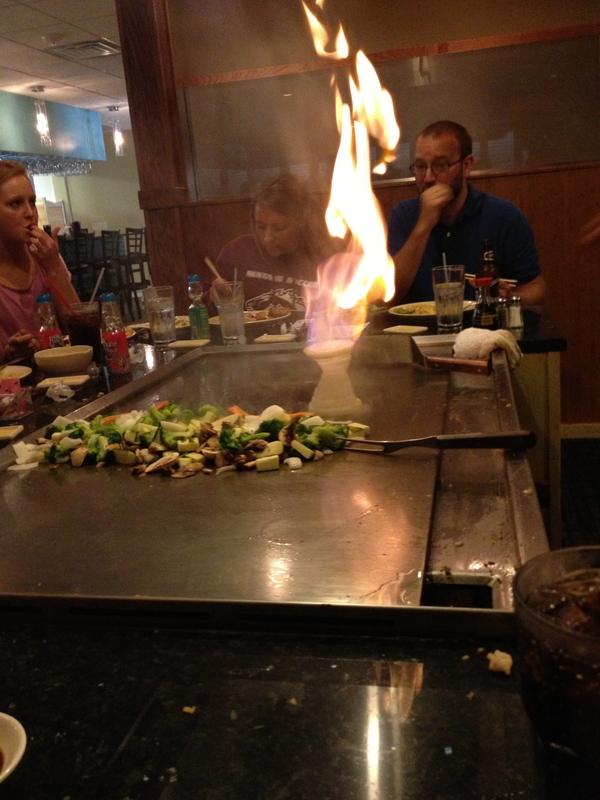 Our class recently split up and went to Tokyo Japanese Steakhouse and Sushi Bar. It is a big building behind the mall and right next to my favorite frisbee golfing course, so I have driven past it many, many times, but have never stopped. I haven’t there for the simple reason that I do not care for sushi or any seafood for that matter. I am a huge fan of steak, so I knew I at least had that to look forward to, but I was also excited to try something new at this restaurant. We were the first customers of the day and the hostess welcomes us right in. The building had a Japanese feel to it as she seated us around a hibachi grill. I had never experienced anything like that, but it always looked sweet on movies. I had never tried calamari before, so I ordered the fried calamari as an appetizer for my meal. I looked over the menu and after talking with the other classmates, decided on the lunch combination. 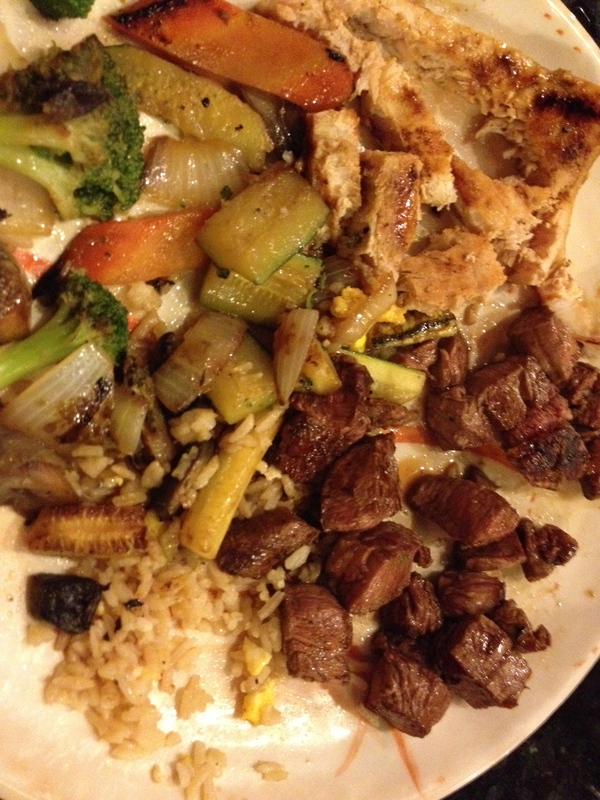 It allowed me to choose two different meat/fish to be grilled with my rice and vegetables. I went with the filet mignon because that is my favorite steak, and for my second option I got the swordfish. This was a big step for me because I have never been able to eat seafood, but the waitress recommended it, so a lot of us tried it. Our hibachi grillmaster came out and began cooking the rice for us, while also entertaining us the entire time. I have no idea what he was spraying on there to cause the high flames, but it was pretty awesome to watch and made it a great dining experience. The calamari came out and was surprisingly really tasty, but I was just a little skeptical while eating it because I knew what it was and that was new to me. 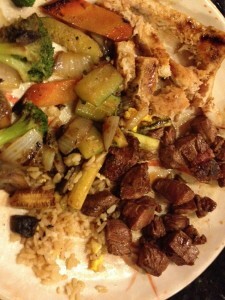 After cooking the rice and vegetables, he started on the meats, and it took no time at all for each one to get cooked. Before I knew it, I had my filet mignon and swordfish on my plate. I dipped the swordfish in what the grillmaster called, “yum-yum sauce.” Wow! That swordfish was good. I could hardly taste the fishiness of it and it went great with the rice and vegetables. I then moved on to the filet mignon and that steak was so juicy and perfectly cooked. I was extremely pleased with my meal choice. I managed to save a little room for dessert and the fried ice cream sounded like it would hit the spot. I was right about that one! It came out and it looked and smelled delicious. It didn’t take long for it to be all gone and then I was finally full. 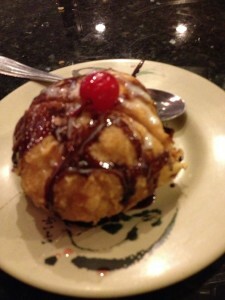 Tokyo Japanese Steakhouse and Sushi Bar has been my favorite restaurant from this course. The atmosphere was relaxing, the service was great, and the entertainment was fantastic. I mind was blown by how great the food was and price was not too bad either. You can count on me returning back to this restaurant soon! YUM!